I primarily use "craft paints" . . . you know, the inexpensive ones that come in 2 fl oz (59 ml) plastic bottles. They are usually found in "craft stores" or "dollar-type stores". Anyway some years ago I purchased a "Provo Craft Spinner Rack". 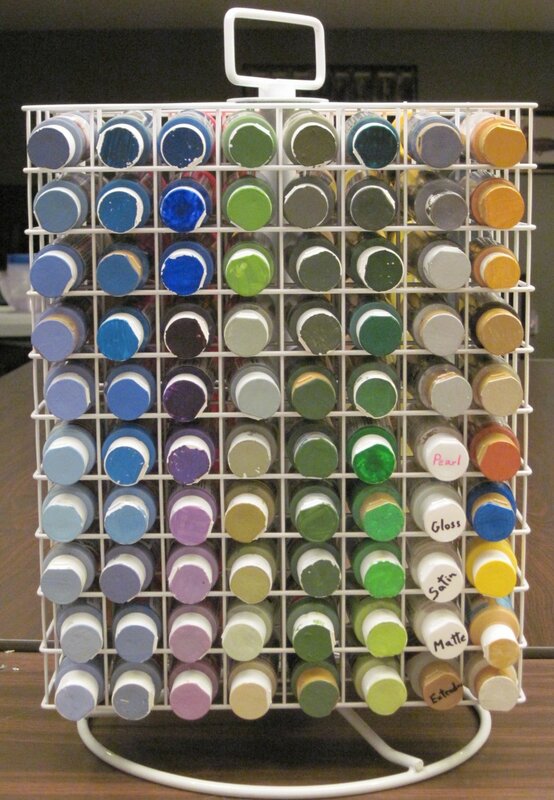 It holds 160 bottles of these 2 oz craft paints. 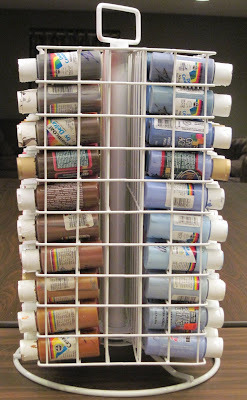 I have found it quite useful for easy view and use of these paints. 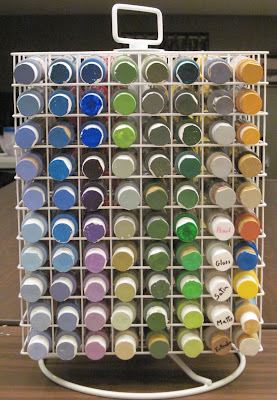 Still I had never come close to filling it until this week when my dear wife gave me her collection of craft paints (her "numb hands" prevent her from controlling her brushes) . . . which also explains some of the colors that don't seem very martial. The image below will show you the "cool side" which also contains the varnishes and metallics on the right hand side. I got my on eBay . . . but you if you want to get one that way you need to take your time. Some folks want outrageous prices for them and others are quite reasonable. I think that I got mine some years back for around $30 plus shipping . . . but check out the cost of shipping before you bid on one . . . again sometimes that cost is unacceptable. I would suggest that you check with any local craft shops first to see if they carry them . . . or how much they'd charge if you ordered one. Below is an image of the side of the rack . . . so you can see the central post that the whole thing turns on. 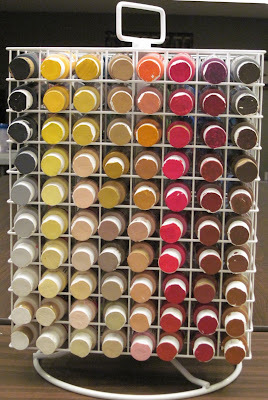 By the way, when full of paints like this it is quite heavy. Finally you will have noticed that I've painted each lid the color of the paint inside. This is because paints can dry either lighter or darker than their "wet" appearance . . . and it makes it very easy to find the shade of color that I want. By the way, while most come with white lids, some craft paints come with a "gold top" (such as the fourth ones down in the photo above). These I first paint white before painting their proper color on them. Jeff, Nicely done. I have one of those carousels, picked it up at a Michaels if memory serves. Mine doesn't look 1/2 so well organized despite my best intentions. I have painted swatches of paint on many of my bottle tops but I like the full coloured top better. Something for me to work on this winter. Great idea. 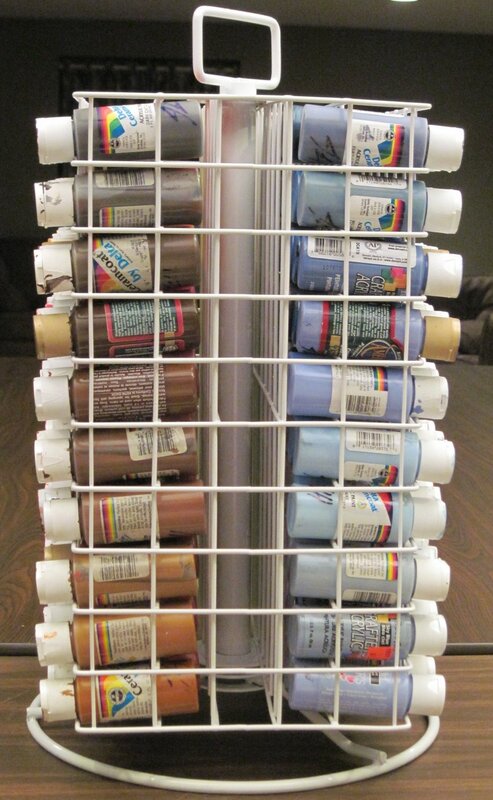 Although I don't have such a nice paint rack as you do, I do try to keep my colors somewhat together. You're far more organized than I am, Jeff. The rack is a great idea. 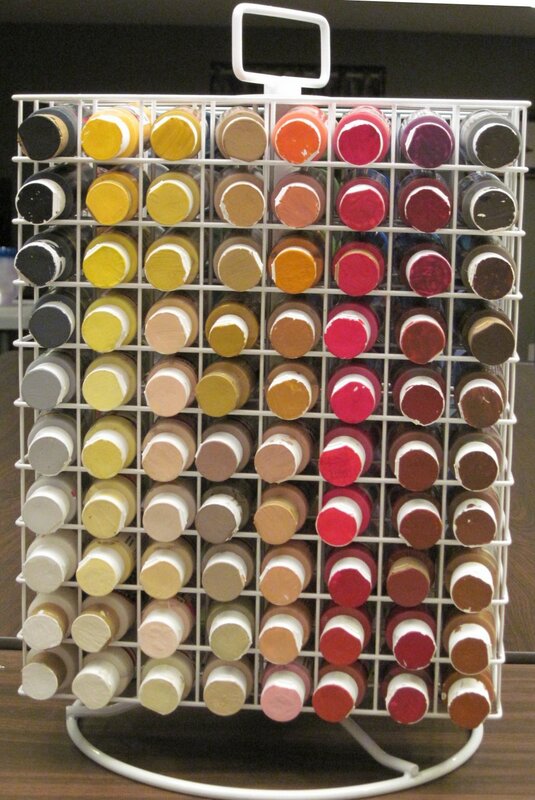 Good collection of paints. Many of te non-martial colours in my collection are actually used for highlighting those more usually associate with uniforms.